Superman's fabled Fortress of Solitude has been depicted in films as a vast complex comprised of enormous crystal beams. Imagine the surprise of miners when they actually found it! Not in the frozen north, but buried a thousand feet below Mexico's Naica mountain in the Chihuahuan desert. This has been quite a year for Superman fans; the deadly remnants of planet Krypton were discovered in a mine in Serbia this past April (see Kryptonite Discovered By Scientist). Actually, of course, the Cueva de los Cristales is a purely natural formation consisting of enormous beams of gypsum. 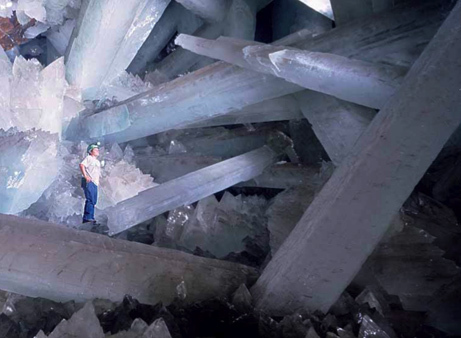 Some of the crystals are as long as 36 feet. Geologist Juan Manuel Garcia-Ruiz has described the probable origin of the crystals in the journal Geology. The cave was drained by mining operations; for millennia, however, the crystals grew in mineral rich, 136 degree Fahrenheit water. This coating is a 'plowshared' technology from P2i, a UK Ministry of Defense contractor. This amazing cave has the enormous beams of crystal that Superman fans have been looking for.